What Can You Expect At A Sentencing Hearing? We all have watched courtroom dramas on TV, in the movies, and even on stage. Invariably, the crucial moment we all wait for is when the jury foreperson gives the verdict. Indeed, the story usually concludes at that point. In reality, however, there is another whole proceeding that follows a jury verdict of “guilty.” That proceeding is the federal sentencing hearing. Because a federal sentencing hearing typically does not fit well in a dramatic narrative for entertainment, those who are not familiar with the real criminal justice system may not know what happens at a federal sentencing hearing. Further, if you are facing sentencing, it is invaluable to have a little insight into what to expect. This article will discuss what goes on both before and during a sentencing hearing in federal court. Hopefully, this window into the sentencing process will answer some questions for you, and prompt you to consult further with your defense attorney if you are currently facing sentencing. A lot happens in the 90 days between verdict and sentencing. Immediately after a verdict of guilty is entered before the court, the judge will schedule a federal sentencing hearing. Although a judge will normally impose a sentence on the same day with regard to a minor offense, any sentence for a felony will require some pre-sentence preparation. Accordingly, the judge will typically schedule a sentencing hearing 90 days from the date of conviction. Those 90 days gives a probation officer time to prepare a Pre-sentence Report, or PSR. The PSR is a long, rather involved, document that is essentially a biography of the defendant’s life, concluded by a sentencing recommendation from the probation officer who prepared the PSR. The probation officer’s first step in creating the PSR is to interview the defendant. It is important that the defendant be completely honest during the interview, given that a false statement to a probation officer is a separate crime. Of course, the defendant can refuse to answer certain questions and may consult with his or her attorney during the interview. The probation officer will likely also ask for signed releases, so that the officer can obtain school and employment records. Also, the probation officer will most likely consult with one or more of the defendant’s family members to verify the information the defendant provides during the interview. With all of that information in hand, the probation officer will create the PSR, and then forward a draft to defendant’s counsel and the prosecutor. The attorneys should be sure to point out any errors in the report, and make objections as necessary. After incorporating any changes, the final PSR goes to the judge, which includes the probation officer’s sentencing recommendation. The judge, of course, is free to accept or reject all or part of the probation officer’s recommendation. During the 90 days between conviction and sentencing, the judge will calculate the applicable sentencing range consistent with the U.S. Sentencing Guidelines. The Guidelines have two main parts: the Offense Level and defendant’s Prior Criminal History. Based on the information of the case, the judge will determine those two parts, consult the Guidelines chart, and arrive at a sentencing range. The recommended federal sentencing range that comes from consulting the Guidelines is merely advisory for the judge, similar to the probation officer’s PSR recommendation. It is important to note, however, that if the judge ultimately orders a sentence that is outside the range recommended by the Guidelines, the judge would need to give proper justification for the departure. In addition, the judge must be sure to consult any mandatory minimums applicable to the defendant’s case. Also prior to the actual federal sentencing hearing, both defense counsel and the prosecutor may provide the judge with a written submission, arguing the points that each deem relevant. For example, a defense counsel may provide a list of reasons why a defendant deserves leniency, may recommend certain “downward departures” of a sentence permitted by the Sentencing Guidelines, and attach letters of support from defendant’s friends, neighbors, and employers in order to persuade the judge to impose a lighter sentence. Conversely, the prosecutor may provide a sentencing memorandum explaining what sentencing enhancements may apply to the defendant’s case and make a sentencing recommendation as well. On the date of sentencing, the judge will first ask the parties if they have received the PSR, and whether there are any changes. It is important to ensure that the PSR is as error-free as possible, because it will be an important part of the history of the case. In fact, it is not uncommon for a PSR to provide important facts for a subsequent appeal, which could occur years after a sentence is imposed. Once the PSR is discussed and edited as necessary, the judge then allows the attorneys, both prosecution and defense, to make oral arguments. Further, the defendant is accorded the “right of allocution.” That means the judge is required to give every defendant in a criminal case the chance to speak before the judge imposes sentence. While it is not required, a defendant may want to say something to the judge so the judge gets a full picture of the person he or she is about to sentence. In some circumstances, the victim or victim’s family may also be allowed to speak at sentencing. Notably, the sentencing hearing, like all court proceedings, is open to the public. A defendant should know that the victim, or victim’s family, as well as friends, family and neighbors could be there. A defendant’s family and friends may also be in attendance. After hearing from the attorneys and the defendant, the judge will announce the sentence. If a prison sentence is imposed, the defendant may be taken into custody immediately, or be given time on bail before having to voluntarily surrender at a later date (usually within 30 to 60 days). The judge may also suggest what prison the defendant should go to, in order to facilitate family visitation. If probation or supervised release is imposed, the defendant will need to report to the probation office. 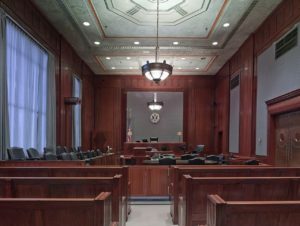 This small look into the federal sentencing hearing process should give a clearer picture of what to expect if you or a loved one are facing an upcoming sentencing hearing. In addition, if you have any questions about a sentencing hearing, or need representation, we welcome you to contact Brandon Sample, Esq. An experienced sentencing lawyer and advocate, Brandon provides high quality federal sentencing representation. Call 802-444-HELP for more details.